Buffy the Vampire Slayer Season 1 has its faults. I will admit this as a diehard Buffy fan. However, I love it overall. Even though I've been dreading this...let's rewatch "The Pack". The "mean kids" trope is something used a lot in teen dramas. Cordelia and her clones are only the popular girls' clique; Kyle and his friends, however, are real mean kids. Their mistreatment of Buffy and Lance comes from left field. We've never met these characters before and we're expected to understand they're the bullies and delinquents of Sunnydale High. I didn't mind it so much. The four actors who played Kyle, Rhonda, Tor and Heidi did a good job. I disliked their characters and felt no sympathy for them when they got possessed later on. Xander: We just saw the zebras mating. Thank you, very exciting. Willow: It was like the Heimlich...with stripes! Buffy: And I missed it. And yet somehow I’ll find the courage to move on. Permalink: We just saw the zebras mating. Thank you, very exciting. Speaking of Lance, did anyone else feel bad for him? He got picked on A LOT. "The Pack" played on the themes of natural selection and the animal kingdom. The bully kids were the hunters and Lance was the prey. They saw him as their weakling. Setting the first scene at the zoo was so very on-the-nose. Before rewatching Buffy the Vampire Slayer Season 1 Episode 6, the animal possession never made a whole lot of sense. How was the one hyena able to affect all five teens? Did it only happen because the marking was there? Could it happen any time? Could Lance have been possessed too? The lore associated with this Monster of the Week was flimsy at best. Later on Giles lightly explains the purpose of this possession, but we don't go deeper. Too many plot holes here about a weak enemy overall. Willow and Buffy finally admitted their crushes. 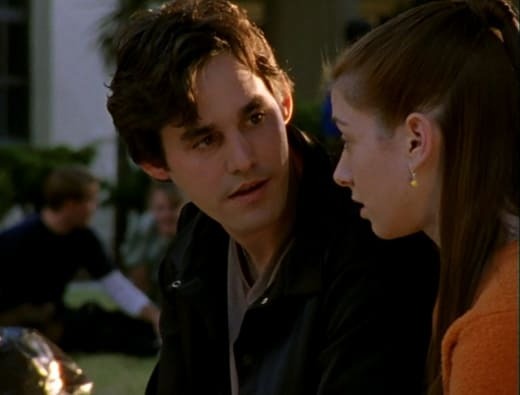 We knew Buffy had an unspoken attraction to Angel (this was a given); however, Willow never openly stated she liked Xander. We, as viewers, knew better. As I mentioned in the rewatch for Buffy the Vampire Slayer Season 1 Episode 5, she obviously had a longstanding, burning crush on him. She knows so much about him, but he doesn't give her the time of day. It's sad to see her in this unrequited state. At least we know she'll find some love in Buffy the Vampire Slayer Season 2. Of course an animal would be introduced in "The Pack". It had to work with the theme. Are real high school animal mascots a big thing? I don't see this often except for TV. My school didn't have one (though, our mascot was a pirate). When the pig was introduced, I had a feeling it wouldn't survive past the hour. It's a tiny little prey and there were possessed teens running around. Poor piggy. He didn't have a chance. "The Pack" had Xander at peak annoying. Sure, he was possessed to be and act as a villain. It still doesn't change anything. He reveled in saying what he wanted, doing what he wanted, and enjoyed the power. The spirit brought out the worst in him; it heightened all of his dark thoughts. I've mentioned before Xander is one of my least favorite characters. And Buffy the Vampire Slayer Season 1 Episode 6 is one of the many reasons why. I can't blame all of his actions on the hyenas. Some of what he said and did is all him. Giles: And, uh, there's a noticeable change in both clothing and demeanor? Giles: And, well, otherwise, all his spare time's spent lounging about with imbeciles? Buffy: It's bad, isn't it? Permalink: It's devastating. He's turned into a sixteen-year-old boy. Of course, you'll have to kill him. It's no wonder his friends were worried about him. A sudden change like this could only be because of the hellmouth. Giles's dry, sarcastic wit is hands-down my favorite moment of "The Pack". He's learning a lot from Buffy. And this quip was a side-eye, tea drinking moment. 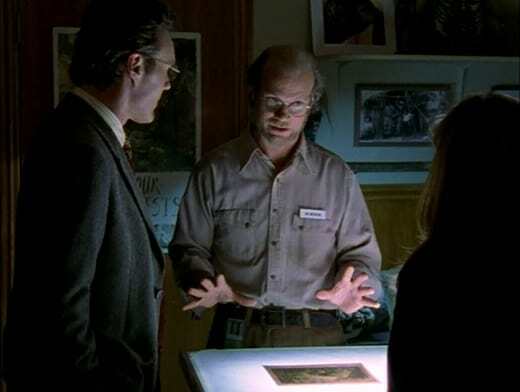 The other funny thing, though, is the connection to figuring out the Monster of the Week. Has anyone noticed that after a quip it leads Buffy/Giles to figuring out the cause? It happens a lot throughout the series. Their jokes and observations open up their minds to the possibilities. Moral of the story: Sass saves lives. My heart broke for Willow. Xander treated her horribly under possession. 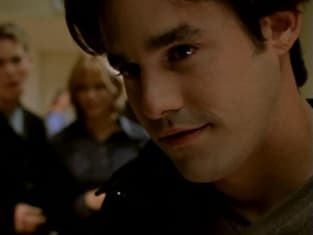 His admission to Buffy, and the fight in the classroom, revealed that he knows Willow has a crush on him. He knew full well and still used this against her. But what makes this worse is all the times he talked about liking Buffy in front of her! I mean...he constantly reiterates to Willow how much he has a burning, unrequited love for Buffy. However, he knows Willow has feelings for HIM. That's plain evil. Xander is the worst. Willow: Xander, what’s wrong with you? Xander: I guess you’ve noticed that I’ve been different around you lately. Xander: I think...um...I think my feelings for you have been changing and well, we’ve been friends for such a long time, then I feel like I need to tell you something. I’ve decided to drop geometry, so I won’t be needing your math help anymore which means I won’t have to look at your pasty face again. Permalink: I guess you’ve noticed that I’ve been different around you lately. Let's talk about the fight scene in the classroom for a minute. The animal spirit may have clouded his judgments, but many of those thoughts were his. He admits to being attracted to Buffy. He knows Willow likes him. And he spews viles comments of what he wants to do to Buffy. This is unfiltered evil Xander. It felt so satisfying to see Buffy knock him out after everything he said. Sure, I'm being a tad rough on him, but the things he said can't be completely excused. How do you think the clique reacted after killing (and eating) Principal Flutie? Removing the possessed animal spirits brought them back to normal, but they remember everything. They remember eating a man. Were they simply fine after that? When the group start channeling the hyenas and attacked the principal, it looked terrifying. The same goes for when they advanced on the mother. As I mentioned above, the guest actors did a great job for "The Pack". Sure, it was cheesy, but they channeled their animals. Buffy: They didn't hurt him, did they? Buffy: They ate Principal Flutie? Giles: The official theory wild dogs got into his office, somehow. There was no one on the scene. Permalink: They ate Principal Flutie? One of my favorite scenes of Buffy the Vampire Slayer Season 1 Episode 6 is the dodgeball game. It's a simple childish game held in a gym. Nothing too complicated. Basically the danger was getting hit by the balls. 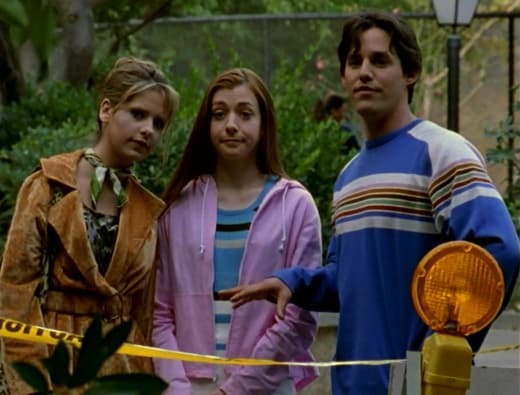 However, seeing the pack recognize Buffy as their equal was an interesting scene. They knew she was strong from the get-go. Many times throughout "The Pack" they could've gone after her, as they did with Lance, Willow and Principal Flutie, but they didn't make that move. Xander tried to exhort his dominance and failed miserably. We know Buffy is a leader and is very capable, but this showed how third party spirits and characters viewed her too. The zoologist (attendant?) was clearly up to something. Similar to Buffy the Vampire Slayer Season 1 Episode 4, there were obvious signs he was the bad guy. Come on! The random stranger knows of the curse and the way to break it? He knew too much. Giles and Buffy should've been more cautious than to trust him right off the bat. And what about the ceremonial makeup?! 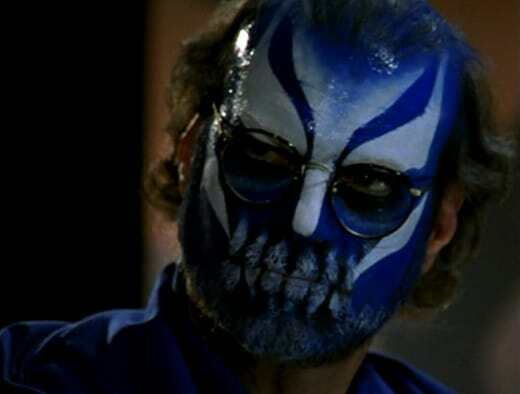 If this guy showed up in costume after only knowing him for an hour at best, I would be hesitant. Giles is so calm as he starts to put the pieces together. You can see the gears turning in his brain. But come on, Willow! She lets him tie her up and be used as a hostage. I can't even with the group here. "The Pack" is a simple episode. It follows an episodic nature to bring another Monster of the Week out of the woodwork. And that's not a bad thing to learn of a new creative. However, not much happened to advanced the plot. Don't get me wrong, we got Willow, Buffy and Xander admitting their real feelings, but this was a one-plot episode. All that happened were the hyena kids...and it wasn't interesting to begin with. What did you think of "The Pack"? Did Xander's attitude rub you the wrong way? Should Willow have forgiven Xander? Was Cordelia's absence noticeable? Want to join us in rewatching Buffy the Vampire Slayer? We will be posting new rewatch posts every Tuesday and Thursday. Come back here and share your comments about what you thought.